The brightly painted town of Camogli (pronounced CAH-mol-yee) is nestled into the hillside of the Italian Riviera between Genoa and Cinque Terre, on the edge of the Portofino peninsula. This fishing village-turned-vacation-town is not super well known among American travelers and is mostly filled with tourists from Italy and neighboring countries. Fishing boats still fill the harbor and bring in fresh seafood to the cute restaurants that line the oceanfront promenade. The little shops on the boardwalk are filled with goods from local artisans rather than the designer duds you’d find in nearby Portofino. 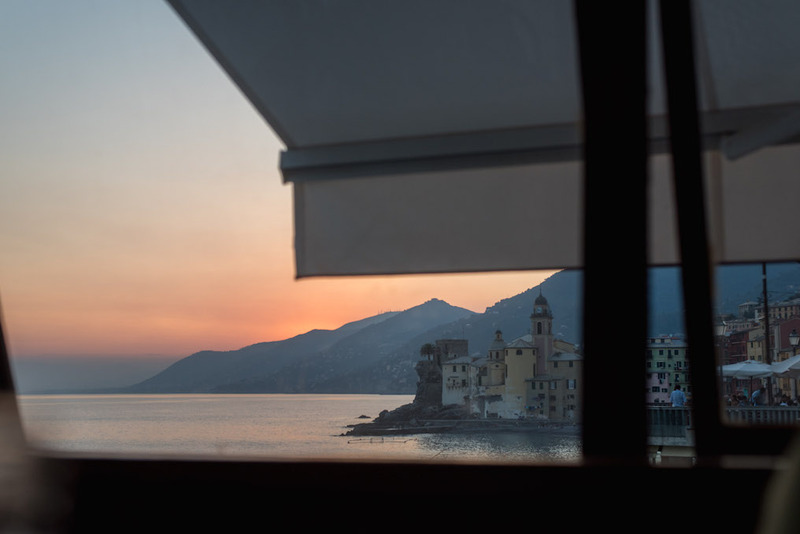 But make no mistake, Camogli is still a chic destination. Opportunities abound to snap postcard-worthy photos. 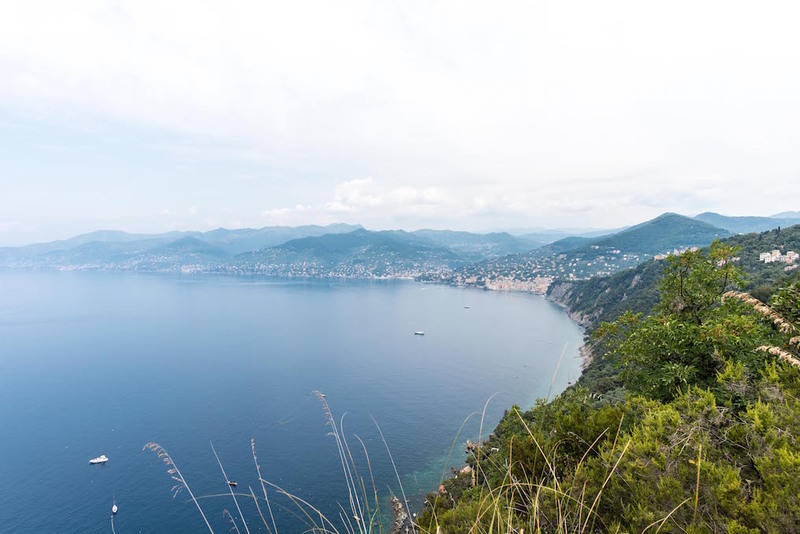 And if adventure is on your wishlist, the adjacent peninsula provides scenic hiking routes that are a rigorous and beautiful alternative to Cinque Terre. Take your family for a beach vacation or take your partner for a romantic getaway; either way, don’t miss this Italian Riviera gem. It’s worth noting that there are a lot of stairs and steep hills in Camogli due to its cliffside location, so it isn’t particularly accessible for differently-abled or injured people. By air: The closest domestic airport is Genoa’s Cristoforo Colombo Airport (GOA), which is only 30-40 minutes away by car or train. The most accessible international airports are Milan-Malpensa (MXP) and Rome-Fuimicino (FCO), which both have train routes to Camogli. By train: Camogli is around 4.5-5 hours by train from Rome and 2.5-3 hours from Milan; typically a quick change at a nearby station is necessary. 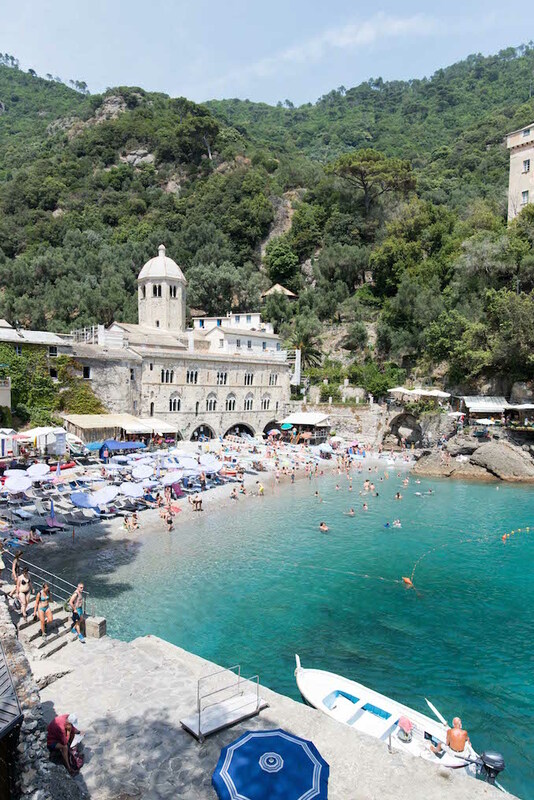 The Camogli-San Fruttuoso train station is a short walk from most areas of the town. 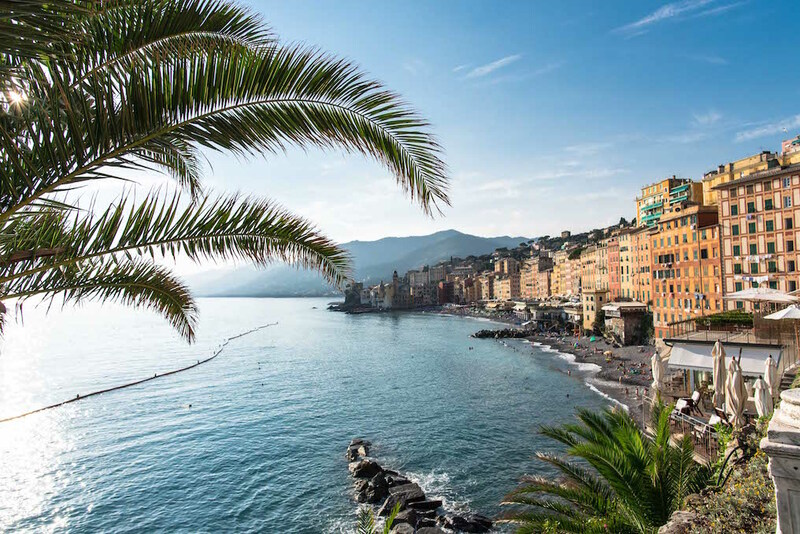 By Car: Camogli is just over two hours by car from both Milan and Florence, three hours from Nice, four hours from Venice, and nearly five hours from Rome. Parking is hard to come by, but nearly everything is within a short walking distance if you can find a spot (or if your hotel has a parking lot). You can find the four-star Hotel Cenobio dei Dogi just at the end of the town’s main promenade, tucked into the base of the Portofino peninsula. The hotel’s scenic pool and two private beaches are a welcome respite from the crowds on the town’s public beach during busy summer months. The hotel’s three restaurants all boast sea views with regional Italian menus and wine lists. All room rates (starting at €170 for double occupancy) include a full breakfast buffet. Most of the tastefully decorated rooms feature a terrace or balcony; a few upgraded rooms have terraces adjacent to the pool with private sunbeds. The hotel has a free parking lot in the front courtyard, and wifi is free for all guests. The hotel staff speaks English and the website has a full English version, so booking and check-in are easy. Read more about why I loved Hotel Cenobio dei Dogi here. Camogli’s roots as a fishing village are evident because most of the restaurants in town have menus filled with fresh seafood options. Don’t miss the chance to order a dish with pesto, because this region is the birthplace of that beloved sauce. But don’t be alarmed when your pesto pasta comes with potatoes and green beans; that’s a thing. Trofie–a small, twisted pasta–is another Camogliese specialty to look out for. Some restaurants charge a €1-3 “cover charge” per person, but no tip is expected beyond that. VAT or taxes are typically included in the menu prices (though they may be listed separately on your bill). Mealtime is a good time to embrace the Italian’s slower pace of life; don’t expect service to be as quick as we’re used to in the States. Italian restaurants don’t expect to turn over tables, so it’s yours for the night. Also, don’t forget to ask for your check when you’re done (most places won’t automatically bring it out because that’s considered rude)! La Camogliese is a romantic, white tablecloth, Italian restaurant perched over the beach with incredible views of the sea, town, and sunset. Dinner starts with complimentary glasses of Prosecco, then proceeds with regional Italian seafood, pasta, and meat dishes. Reservations are recommended, though walk ins are allowed. Il Portico, or “la Spaghetteria” as the awning says, is a casual, pasta-centric restaurant on the promenade. The extensive menu features a variety of reasonably-priced options, and the seating (both indoor and outdoor) is very family-friendly. They offer most of the dishes in disposable to-go containers, which is perfect for taking a little pasta picnic to the beach or the steps of the church across the street. Da Paolo is a hidden gem tucked away on a small side street. The menu of expertly prepared, regional dishes more than makes up for the lack of sea views. 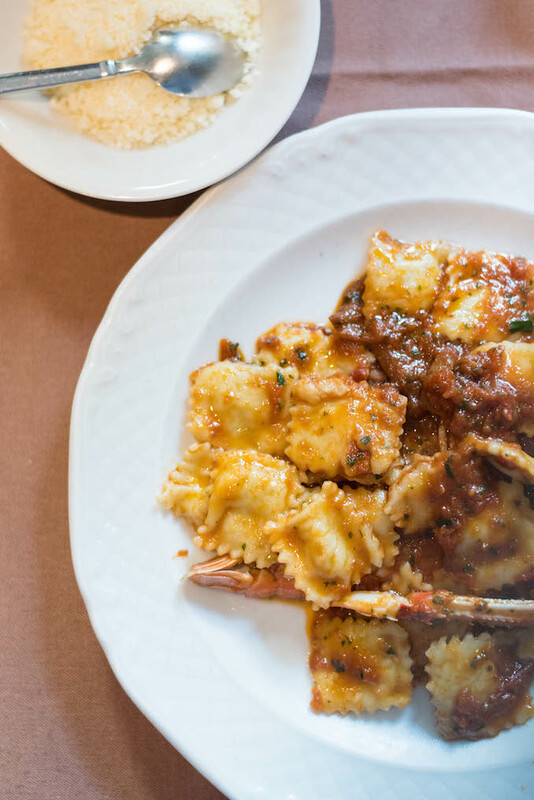 The seafood ravioli is worth the trip alone. The quaint dining room is best suited for adults, and it’s perfect for a group of two to four. Due to the small number of tables, reservations are highly recommended for dinner. There are a number of gelaterias lining the beachfront promenade in town. There’s no shame in a scoop (or two or three) a day! Switch things up with granita (flavored, shaved ice) or a gelato milkshake. 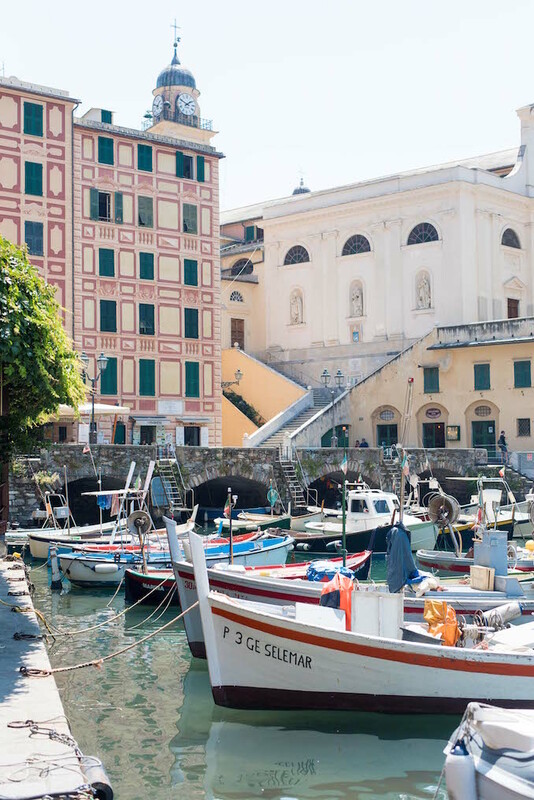 Explore Camogli: The town is easy to cover in a single day. Check out the harbor full of picturesque fishing boats. See the church and castle, Basilica di Santa Maria Assunta and Castello della Dragonara. Shop and eat along the promenade. Swim & paddle: The large, pebble beach is open to the public with ample room for swimming (but beware that the water is fairly cool). Multiple companies offer kayak and stand up paddle board rentals. 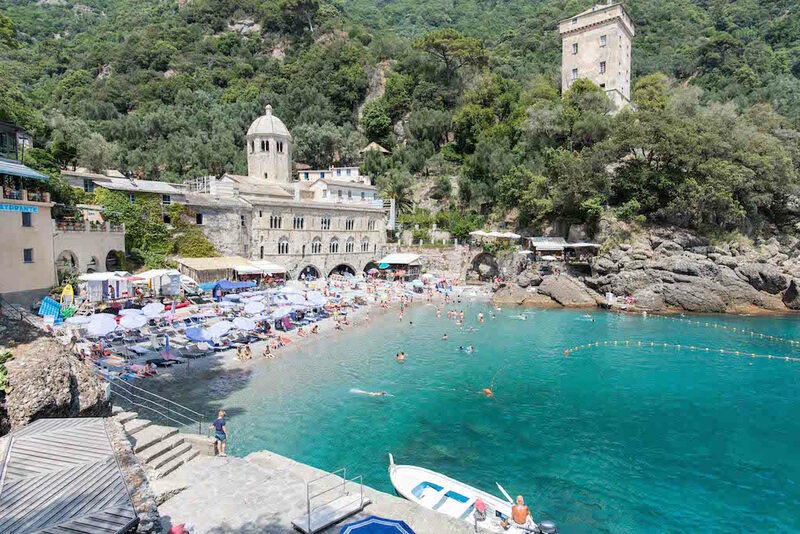 Explore nearby: The towns of Recco, Santa Margherita Ligure, Rapallo, and Chiavari are all easily reachable by train and provide more opportunities to shop and eat. Hike: The hiking trails of Portofino National Park start just outside of the Hotel Cenobio dei Dogi’s entrance. The trail starts with a quick hike up paved stairs to San Rocco, a small, hilltop town with a little church, bakery, and a couple restaurants (I’ve heard from multiple sources that Nonna Nina’s is amazing). This first portion only takes about 30 minutes and is suitable for children. The trails continue on to Punta Chiappa, an outcropping with room for sunbathing and picnicking, or to San Fruttuoso, where you can find a 10th century Abbey and pebble beach only accessible by boat or foot. The San Rocco to San Fruttuoso ocean view trail is pretty strenuous, but the payoff of this 3.5 hour hike is amazing. The San Fruttuoso to Portofino portion is less treacherous (no chains and narrow paths), shorter (only 1.5-2 hours), and more suitable for a range of fitness levels. See more details, photos, and a video of the hike here. Take a boat trip: A few companies offer ferry service from Camogli to San Fruttuoso, Portofino, and other towns along the coast. Day trips to Cinque Terre by boat are also available. Traveling to Italy in July meant that we would be there in the height of tourist season, making hotspots like Cinque Terre almost unbearably clogged with tourists. In fact, Italian officials announced earlier this year that they would start limiting the number of tourists allowed into the five villages of this UNESCO World Heritage site. After deciding to skip Cinque Terre, we still wanted to find a scenic harbor town with gorgeous views and great hiking. I haven’t been to Cinque Terre, so I can’t totally compare, but Camogli checked off all the boxes we had. 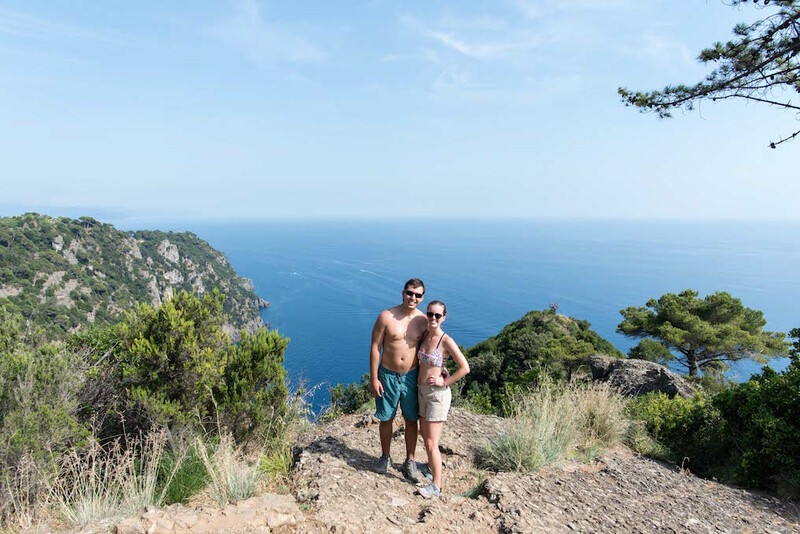 We found a high-end hotel at a reasonable price (see above), the views of the Ligurian Sea and painted town were spectacular, and the well-marked hiking exceeded our high expectations. Even in peak season, we were able to walk into restaurants without reservations and wading through the crowds wasn’t cumbersome. We passed only six other hikers in over five hours of hiking, and Portofino National Park didn’t require any entry fees. I have no doubt that we made the right decision for us. What’s not to love? 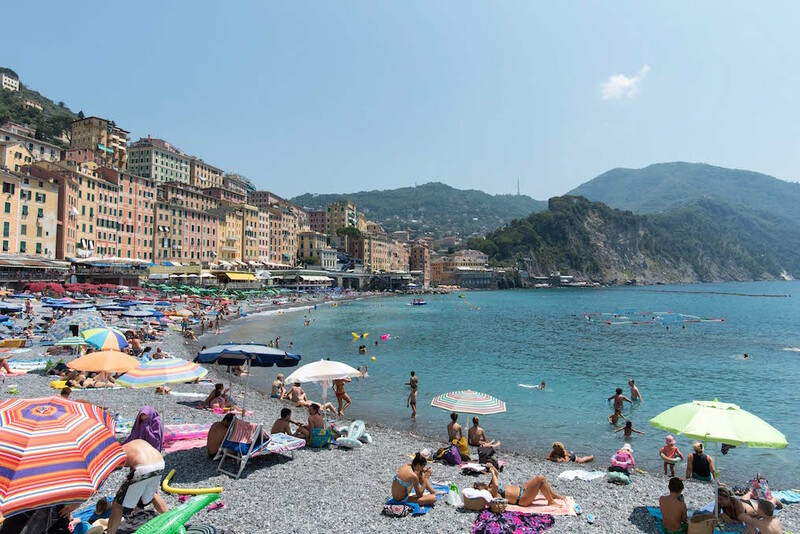 Camogli is small, chic, and easily walkable, but doesn’t have many American tourists. The steady diet of fresh seafood, pesto, pasta, and gelato is something to aspire to. The impossibly cute painted buildings and Ligurian Sea create a frame-worthy backdrop for every photo. The proximity to excellent hiking and water activities give the opportunity for adventure, while the laidback town offers plenty of room to rest. The very convenient train station makes getting in and out a breeze. And it’s just so darn beautiful. We traveled as a couple in July 2016.